Titanfall 2 (Xbox One, PS4, PC, October 28 2016) - I had no luck getting hands on time with Battlefield 1, but I did manage to get in a round of Respawn’s FPS sequel. I’m a campaign guy more than I am a multiplayer guy, but only multiplayer was there. We played a round that felt very similar to the first Titanfall’s multiplayer. Except there were grappling hooks... which I only realized once we were done. Whoops! My team won anyway. And we were playing with PS4 controllers to boot. Titanfall multiplayer always feels good to me. It’s the campaign I’m most eager to try. Sea of Thieves (Xbox One/PC, release date TBD) - The game that could be the pirate take on shared world games like Destiny or The Division still seems very early, but even the early 5v5v5 pirate ship battles shown last week were very enjoyable. I shot a video of the game that you can see above. I’m not convinced that the game’s development studio, Rare, is going to build as grand a world as they’ve been hoping and hyping. If all they make is a ship combat game that also lets you get drunk on virtual rum, they’ll still have done well. 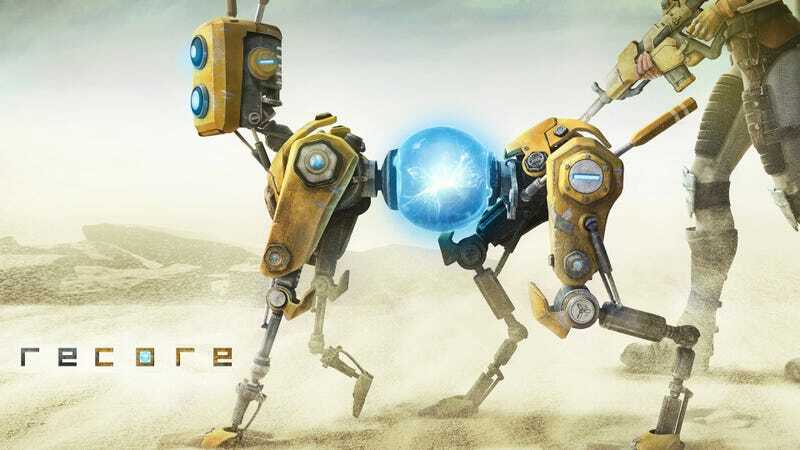 ReCore (Xbox One/PC, September 13) - I was sold on ReCore last year, when I learned that it was being designed by the lead creators of my favorite gaming series, Metroid Prime. This third-person action game is by no means a clone of the classic first-person adventure series, but there are similar qualities. The art direction is strong, particularly the look of the game’s heroine, Joule, and her robot companions. The game design seems to cater to players who want a game world that feels like a big puzzle, even during combat. Joule shoots a laser that can fire one of four colors, each performing best against enemies of the same color. She has robot companions, each of whom have their own special attacks and color-coded traits. The robots are also used to solve environmental puzzles. In the game’s E3 demo, for example, the spider bot can be used to ride up tracks on walls, a bit like Metroid Prime’s spider ball. As for something not at all like Prime, Joule can do a sort of fishing game to finish off weakened enemies instead of shooting them. Frustratingly, Microsoft didn’t release much gameplay footage of ReCore at E3 and wasn’t permitting direct feed capture. In the very final minutes of E3 I at least filmed a video you can see here. Gears of War 4 (Xbox One/PC, October 11) - What I liked about the previous Gears of War campaigns wasn’t evident in the slice of the campaign being shown off at E3. Sure, the graphics were impressive and the active reload mechanic is still satisfying, but the E3 level’s march through a rush of screeching, scampering enemies felt disappointingly basic. The best of the Gears campaigns presented a similar design approach to, of all things, Nintendo-style design, with new ideas–mobile cover, the presence of swarms of bat-like enemies, etc–being introduced safely, then tweaked as the player begins to understand them and learns how to deal with them. There was one potentially interesting idea in the stretch I played. I could shoot alien blobs on the ceiling so that they’d drop and serve as cover, but nothing came of that in the bits I played. Lawbreakers (PC, 2016) - Multiplayer games are not my strong suit, but I’ve been curious about what exactly sets Lawbreakers apart from so many other competitive shooters. The mode I played at E3 is called Turf War and it has some good things going for it. I competed in a trio of 5v5 matches in that mode. Basically, we had to claim control points. The twists: First, the center control point had a zero gravity field around it, so combat there took place mostly in mid-air. Second, claiming one of three control points would lock it in for our team, raising our score by one, but eventually, all three claimed control points would reset after a short interlude. Between those resets, kills of enemy players affect how fast you can claim control points in the next round. The designers also encourage each side to try to kill the other players right before the intermission ends so that enemy players are stuck in a respawn limbo right as the next round of control is going to begin. Confusing? That’s how I felt when the developers explained it to me, but one game later, it made perfect sense and was a lot of fun. Bound (PS4/PSVR, August 16) - More to come about this on Kotaku, for sure, but in brief: Polish studio Plastic is working with Sony Santa Monica for a Journey-style low-stress platformer that just looks fantastic. The body movement for the main character is based on mo-capped dancers, so she jumps like she’s in a ballet, one leg forward, one leg back. It’s great and looked quite good in PlayStation VR, too. Lego Dimensions Year Two (PS4, PS3, XB1, XB360, WiiU, Starting in September) - I played just a tiny bit of this, using some of the new Ghostbusters in a new story level and playing as Adventure Time characters in a multiplayer battle mode. No great revelations here, as it all is a continuation of the design ideas of last year’s Lego Dimensions game and is tailored for people who like the Lego games (me!) and also want to collect Lego figures to play a video game (not me...). Injustice 2 (XB1, PS4, PC, 2017) - I played this fighting game as the Red Lantern Atrocitus, using his angry cat Dex-starr to help me try to beat up Aquaman. Atrocitus is new in the sequel and literally spits fire. Sadly, I failed to beat Aquaman. Water beats fire, I guess. Then the developer who was showing me the game maxed my character out, allowing me to attach all sorts of armor upgrades. I used this better Atrocitus against Batman, who stood no chance. Fire beats bats! Arkham VR (PSVR, October 2016) - As my colleague Patrick did before me, I virtually donned the Batsuit and then investigated a crime scene in Rocksteady’s surprise virtual reality appendage to their Arkham game trilogy. It’s a detective story and is low on character movement, but big, relatively speaking, on searching for clues. It also might make you feel tall. Rocksteady’s chief game designer Sefton Hill and I are short. He watched me do the demo. Afterward, we briefly discussed how the demo was designed to make us feel like we’re a super-hero who stands more than six feet tall. This is what we needed VR for! Psychonauts In The Rhombus Of Ruin (PSVR, release date 2016) - I put on a VR headset and found myself in an airplane full of Psychonauts characters. I could psychically poke them, blast them, and set things on fire. I could also hop from one character’s brain to the next, shifting my perspective so I’d see things from their eyes. Rhombus of Ruin is basically a point-and-click game in VR. It was physically comfortable to play, but I was really stressed playing this at E3, trying to solve puzzles while I knew people were waiting their turn. I’ll enjoy this one more at home. Paper Mario: Color Splash (Wii U, October 7) - Nothing like playing a game for the first time in a small meeting room containing six Nintendo personnel, including the producer of the game and the guy who dreamt up Animal Crossing. Not when you know that the longer you play, the less time you’ll have left for an interview. No pressure here, either! Not even when I was having trouble finding all of the hidden toads. I’ll have more about this game in a standalone article. For now, I’ll risk the wrath of the haters and say I liked what I played. It’s a controversial game, I know. The Legend of Zelda: Breath Of The Wild (Wii U/NX, 2017) - I found this obscure game at the show. Weird how it didn’t get more attention. It’s pretty good. Asura - The indefatigable game developer Zainuddin Fahad waited for me to finish non-VR and VR demos of Bound, then sat down with me on the floor of the PlayStation booth, took out his laptop and booted up his hack and slash roguelike that draws from Indian mythology and randomizes your skill tree every time you start a new game. Props to him for hustling a game demo in the middle of the show. It’s a miracle no one in the PlayStation booth stepped on us! I asked him to send me a build. Four Sided Fantasy (PlayStation 4, Xbox One, PlayStation Vita, Wii U, PlayStation 3, Summer) - This was the most mind-bending game I played all week. It’s a 2D platformer that harkens back to the challenging designs of Braid. The core gameplay gimmick is that you can lock the frame of the level in place, so that it then wraps as one contiguous space. When you do this, running to the right no longer scrolls the level to the right. Instead, running to the the right lets you emerge on the left. Falling down a pit lets you then fall from the sky. The concept clicks quickly and produces some challenging, satisfying puzzles. The video above might make this more clear. Mekazoo (PC, XB1, PS4, Wii U, 2016) - What a surprise this was. It has shockingly detailed, polished graphics and some dazzling platforming based on the concept of changing from one animal form to another. I hopped as a frog, using my tongue to attack enemies and swing from posts. I rolled and boosted as an armadillo. I hopped as a kangaroo. Videoball (PS4, XB1, Windows, Mac, July 12) - Occasional Kotaku columnist Tim Rogers is nearly done with his three-on-three sport game. It’s like soccer, sort of. It also has a great trailer that anyone who has read Tim’s Kotaku columns could have guessed was written by Tim. Black The Fall (Autumn for PC, 2017 for console) - An intriguingly, dark sci-fi side-scroller about living in a communist nation. My colleague Jason and I took turns playing this, slowly learning some mechanics involving remotely controlling other characters. There’s some thematic and stylistic overlap with the upcoming Playdead side-scroller Inside, but if this game is even half as good as that one–and it was impressive at the MIX event–then it’ll be worth playing. Shard (Platforms TBD, release date TBD) - This is a co-op side-scroller in a world in which the characters and the landscape are all made of triangles. The game felt rough and early, as movement felt too imprecise. But there’s a wonderful twist to the co-op: each player can use any of the game’s special high-jump, digging and sprinting powers, but they can’t both use them at the same time. This forces players to have to talk things through and decide, say, who needs to use the high-jump next to get out of a deep pit. That’s a simple concept with tremendous potential. Rhythm Heaven: Megamix (3DS, During E3) - I should have gone to bed, but I had Rhythm Heaven to play. I’ve only accessed old stuff so far, but maybe the game is mostly/only old stuff? Mario & Luigi: Dream Team (3DS, August 2013) - This is a quality RPG, people. But the tutorializing never ends. My mother didn’t hold my hand this much. I also saw a lot of games at E3 that I didn’t play: Headlander, Everything, Telltale’s Batman, Gnog, Far, For Honor, Star Trek Bridge Crew and many more that I’m probably forgetting. Plus, Patrick and Jason tried out a bunch that they’ll be telling you about soon.